Bottom line: this RoboCop works, and it works really well. It’s not a classic like the Paul Verhoeven original, but it is an excellent, intelligent SF drama. It’s one of the boldest Hollywood reboots we’ve seen yet, taking a film widely viewed as unremake-able and turning it into something very different, while honouring its source at every turn. The film has the nerve to play the famous RoboCop theme over its title card, even as it telegraphs that it’s taking us somewhere else. Remember the moment early in Verhoeven’s film, when the ED-209 rasps “Put down your weapon”? Now imagine that moment replayed on the streets of Tehran, with a child. As in the original, the main setting is future Detroit. Our hero is upstanding cop Alex Murphy (Joel Kinnaman from the American The Killing), though his partner Lewis has been changed to a guy (The Wire’s Michael K. Williams). Fans have fulminated about even this change, and ranted about Murphy’s altered origin. Rather than his torture/execution in the first film, he gets blown-up by a car-bomb. He’s still alive when he’s converted into RoboCop, with the anguished consent of his wife (Abbie Cornish). If you see these changes as blasphemous, then we can’t persuade you otherwise. At least you’ve still got the original film to enjoy, along with the 2012 Dredd, which came closest to its violent spirit. The new RoboCop, on the other hand, seems to have taken notes from Source Code. Like that film, it’s about a trapped, raging, implicitly emasculated protagonist and his relationship with morally compromised guardians. Michael Keaton is excellent as a smart, seedy executive who bankrolls the RoboCop project, and Jay Baruchel is amusing as a no-morals marketer. But it’s Oldman in the plum role, playing neuroscientist Dr Norton. A sympathetic Frankenstein figure, he’s introduced in a scene where he helps an amputee play a guitar with artificial hands, foreshadowing RoboCop’s themes in miniature. You’re all the more engaged because you don’t know which way Oldman’s character will finally go; he’s like the Vera Farmiga character in Source Code. Oldman leads the film through moral, conceptual and philosophical territory while never bogging things down. To keep pace with him, the film frequently layers multiple images upon images. At one point, a black-and-white Frank Sinarta film clip glides around a VR backyard in Murphy’s nostalgia-drenched cyber-dreams. Murphy’s family plays an active role this time. 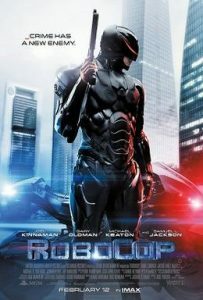 The old RoboCop was left to haunt his former house like a lonely ghost; the new version is frightened by having to reconnect with his wife and son. Kinnaman’s unvisored face twitches with terrible tension; his homecoming is played with great delicacy. It’s only afterwards that a plot development makes Murphy more like the ‘80s action poster icon, an efficient, pitiless arrest machine who plunges after crooks like a lion chasing rats. This is satire which confronts the audience. Hey, isn’t this the RoboCop you wanted to see? The action is slick, and used cleverly to drive home the message that the human Murphy can be crueler and deadlier than any inhuman robot. But – as we knew already from the certificate – the action can’t be the film’s wild, shocking heartbeat as it was for Verhoeven. With the body horror transferred to the Frankenstein scenes, the action set-pieces need other hooks. One shoot-out is made out of strobing lights and thermal images. Another plays to mecha-heads, setting RoboCop against a pack of dino-like ED-209s. Michael K. Williams gets a terribly raw deal as Murphy’s cop partner, sidelined from so much of the action that you just forget him. It’s not the splatty gore which you miss most from Verhoeven’s film, but his twisted humour. There’s one inspired moment when a shoot’em’up is set to the “If I Only Had a Heart” ditty sung by the Tin Man in Wizard of Oz. If only there was more where that came from. The last face-off in the film fares worst; its earnestness is blandly flat, whereas the sign-off in the original made you punch the air with its straight-faced campiness. Driven by its ideas, script and actors as much as its effects, this remade RoboCop is quality SF that plays confidently as if it’s beginning a franchise. Small wonder Gary Oldman looks at home. Forget unworthy Robo-sequels; the reboot gives us a clean slate. We’d buy that for a dollar.